Given the complex nature of security and surveillance operations and the vast amount of heterogeneous data which requires aggregation and analysis, the need for advanced technologies which can make sense of information and alert the relevant parties to crucial intelligence has never been so great.The ability to correlate and cross reference data gained from multiple applications such as ANPR and iSAS with other sources allows organizations to adopt an intelligence led approach to security and surveillance operations. Command and Control Level I offers a simple rule-based solution. 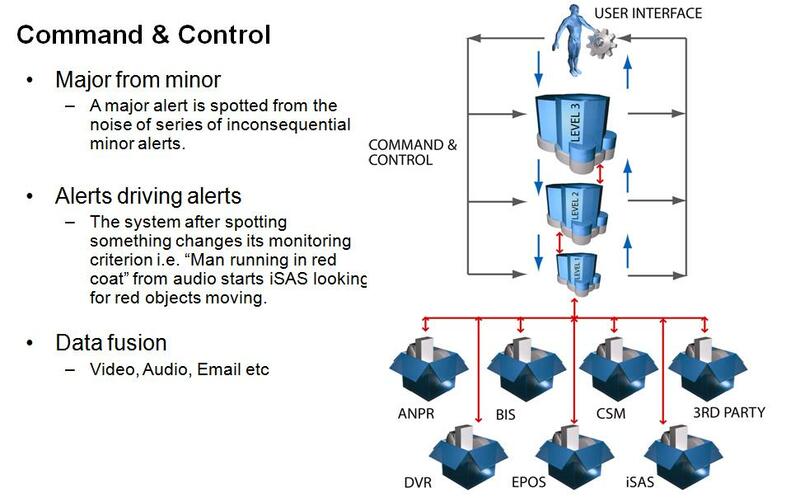 Any number of iSAS products can be connected with the Command and Control system which performs as per instructions pre-defined by a systems administrator. For example, if DVR /NVRand EPOS were set up with Level I, the system could be programmed to highlight particularly unusual till transactions such as large sums of cashback on the logged till transaction data. NVR and CSM might also be deployed with Level I to monitor traffic at a port and could be trained to raise a barrier for particular vehicles whilst disallowing entry for others. distance between the two points, the system could calculate distance traveled within a given time frame and therefore what speed the vehicle/s must have been traveling at. Another example might be deploying NVR and ANPR to monitor carpark usage in multiple locations and calculate usage percentages based on initial numbers collected i.e. the system could highlight that the central carpark has the highest usage at 50% whilst north and south car parks have 20% and 30% usage respectively. Our Command and Control Level III has been fully integrated with IDOL Search technology to deliver a complete state-of the-art solution for all security and surveillance needs no matter how complex. Through this intelligent platform, we offers users the ability to form a conceptual understanding of information and recognize potential threats automatically. Autonomy’s core technology is used by some of the most prestigious intelligence and defense agencies worldwide including the U.S. Department of Homeland Security, U.S. Department of Defense, The British Ministry of Defense, the Olympic Games Security Committee, National Nuclear Security Administration and numerous other intelligence and defense agencies worldwide. One of the key reasons organizations choose Autonomy, is its ability to discover “the unknown” which has a significant impact upon the efficacy of many world-renowned security agencies. 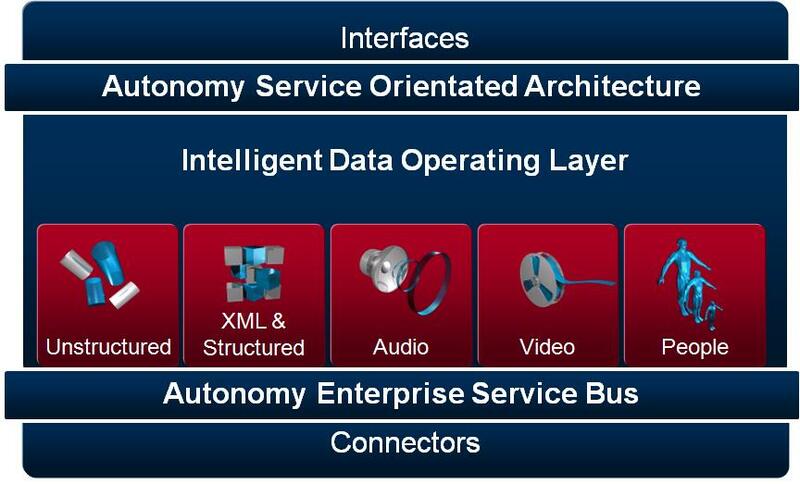 Autonomy’s technology IDOL's forms a conceptual understanding of all forms of unstructured, semi-structured and structured data be it visual, auditory or alphanumeric in character. At its core, the technology uses a combination of Bayesian Inference and Shannon’s Information Theory to automatically extract the key concepts from any piece/s of information. As a mathematical platform, it is not constrained by the limitations of linguistic or rules-based models. Distinct concepts, ideas and behaviors are exposed within any data set on the basis of mathematically derived coherence and not rigid conformity to predefined structures or characteristics. This enables the technology to recognize the potential threat for the first time, both at a tactical and strategic level, without prior training or insight. Operationally, this results in an intelligent surveillance infrastructure capable of instantly and automatically fusing vast quantities of heterogeneous data, identifying interrelationships, spotting important trends and alerting surveillance officers to this vital intelligence. Additional functionality can be seamlessly integrated into the system in order to perform further advanced data fusion operations.